THE SIEGE OF REGINALD HILL is out TODAY! …And it’s a no. 1 new release on Amazon in Teen & Young Adult Christian Science Fiction! I’m not sure if any of my books have achieved a little orange banner before, but this is the first time I’ve actually noticed, so forgive me for sharing the screenshot like a proud parent! Info about the new book! Info about the Launch Blog Tour! Info about how to win a $10 Amazon Gift Card! SAFETY IS NOT THE ABSENCE OF DANGER, BUT THE PRESENCE OF GOD. Fr Kyle Verrall is living a quiet life as a parish priest in Africa when he’s snatched from his church one night by armed assailants. He’s in big trouble—his sister’s worst enemy is hell-bent on taking revenge on the famous Margaret Verrall by killing her brother, just as slowly and horribly as he can. What could possibly save him? The humble young priest is defenceless—or so Reginald Hill believes. But Kyle has a powerful weapon Hill knows nothing about. And he’s not afraid to use it. Is Reginald Hill really the hunter? Or is he the hunted? BROTHERS came out of nowhere about this time last year, and once it was published someone emailed me and wanted to know when another book about Kyle would come out. I emailed her back very confidently saying that BROTHERS was a one-off and I’d no plans to write any more about him. The Holy Spirit clearly heard me! 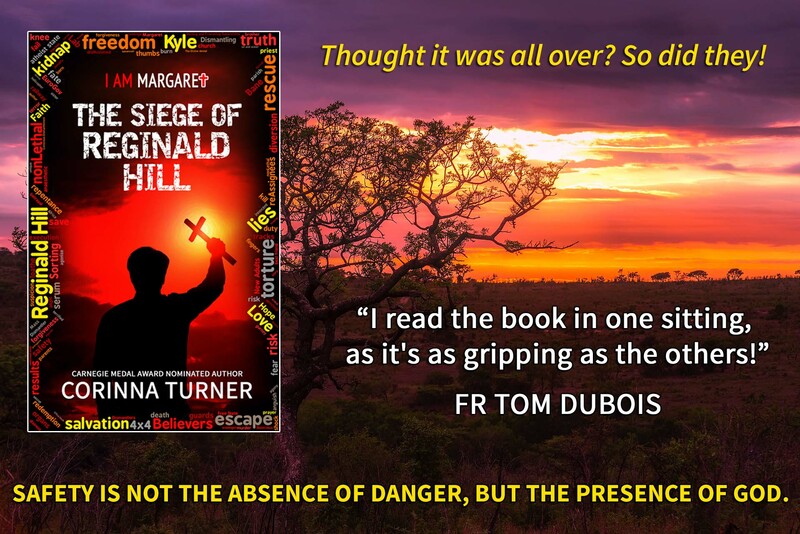 The following morning I was unable to get on with anything because the plot of THE SIEGE OF REGINALD HILL was so busy unwinding in my head! Phew, it was a tense morning! I immediately knew I had to write the story and set to work, in-between publishing a couple of fun books I’d written some years earlier (ELFLING and MANDY LAMB AND THE FULL MOON). I thought I was writing a long novella, but when I’d finished it in July I discovered that it was in fact a short novel! I hope you love it as much as I do. It has a special place in my heart! Please note: This book is more suitable for older teens because of intense scenes. 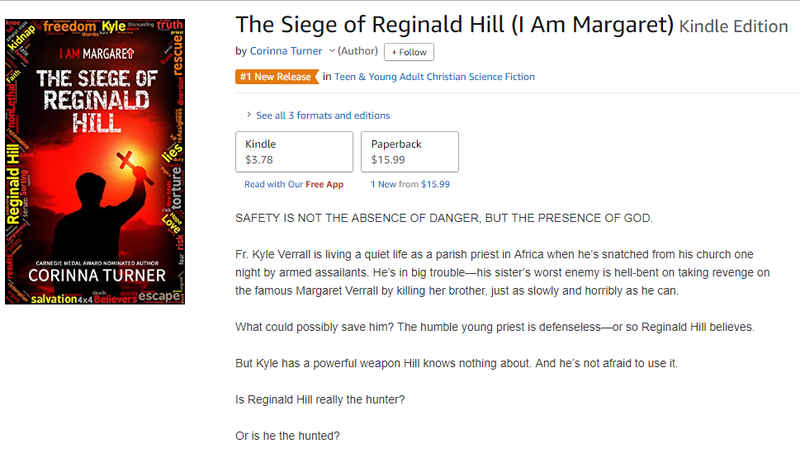 Anyone who was okay with I AM MARGARET should be okay with THE SIEGE OF REGINALD HILL, but as always, parents, if in doubt, please read it yourself first! What do the reviewers think? The Siege of Reginald Hill is a powerful story of sacrificial love—the kind very few are ever called to. 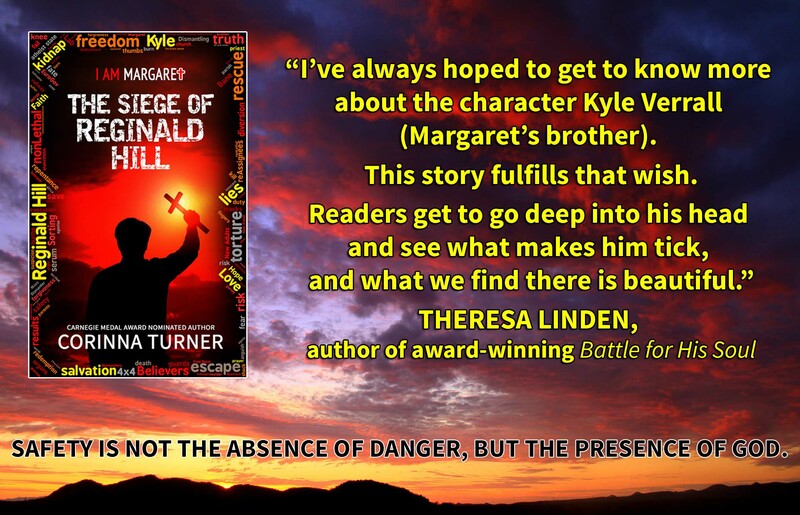 Kyle is faced with unbearable pain and suffering, but he handles it in an amazing, almost unfathomable way. … If you’ve enjoyed the I Am Margaret series, you will love this story. There are a few stories that I’ll never forget even though it’s been years since I read them. Henry James’ The Beast in the Jungle and C. S. Lewis’ The Great Divorce, and now Corinna Turner’s The Siege of Reginald Hill. An extremely powerful example of what it really means to love our enemies, this novel provokes a whirlwind of emotions. What an eloquent priestly figure is given us in The Siege of Reginald Hill! No time is wasted by the young priest on his awesome journey to reach the lost sheep. Fr Kyle’s example reminds the reader that our sufferings lead to victory when united with the sacrifice of Christ. The Siege of Reginald Hill is another suspenseful and moving work by Corinna Turner. Fans of I Am Margaret will love the continuation of the story! REGINA DOMAN, author of The Angel in the Waters and the award-winning Fairytale Novels series. 2. The Launch Blog Tour! Check out all 10 fantastic stops over the next 12 days! 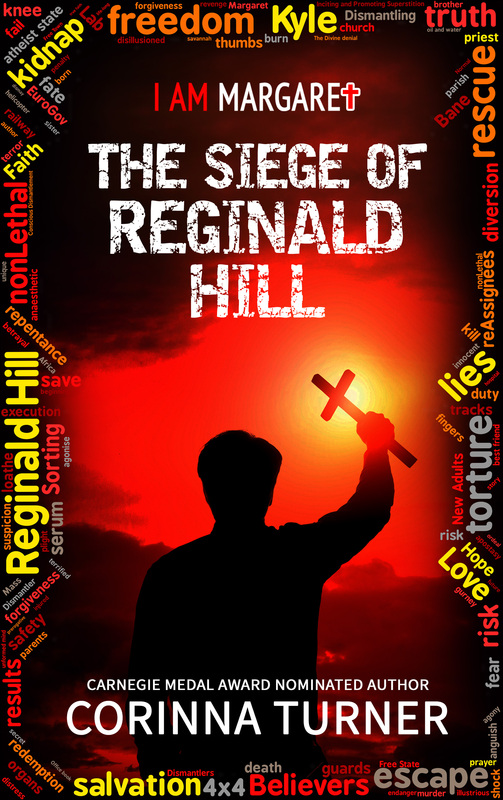 Dec 2 – SUNDAY – Relax and crack open your copy of THE SIEGE OF REGINALD HILL when you get back from church! Dec 9 – SUNDAY – Relax and crack open your copy of THE SIEGE OF REGINALD HILL when you get back from church! 3. That $10 Amazon Gift Card! I need your help from December 1st-12th! Will you help me spread the word? Please tell your family, friends, youth group, and church community about the new book. As a thank you, I’m offering the chance to win a $10 Amazon gift card. It’s easy to enter! Just share my promotional images on Facebook and Twitter—or email them to your friends, whatever you like! 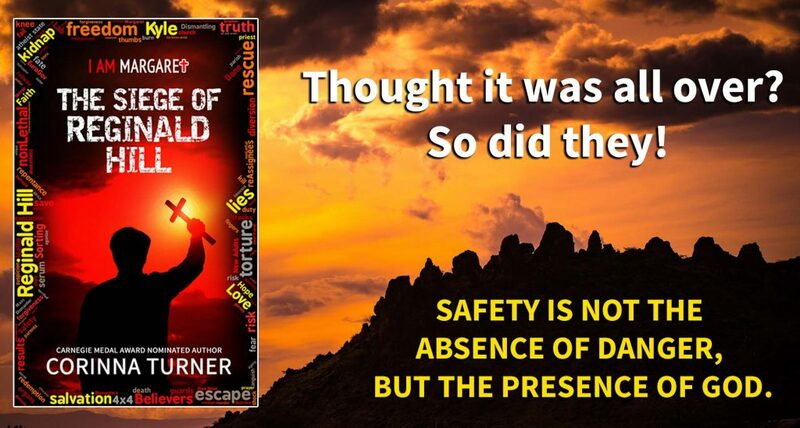 Send me an email or Facebook message to tell me what and how many times you shared about the book. You’ll get one entry for every share! The winner will be drawn on the last day of the Blog Tour! Thanks so much for your help! I hope you enjoy THE SIEGE OF REGINALD HILL. Powered by Paяabola & WordPress.